Hello lovely Friends! 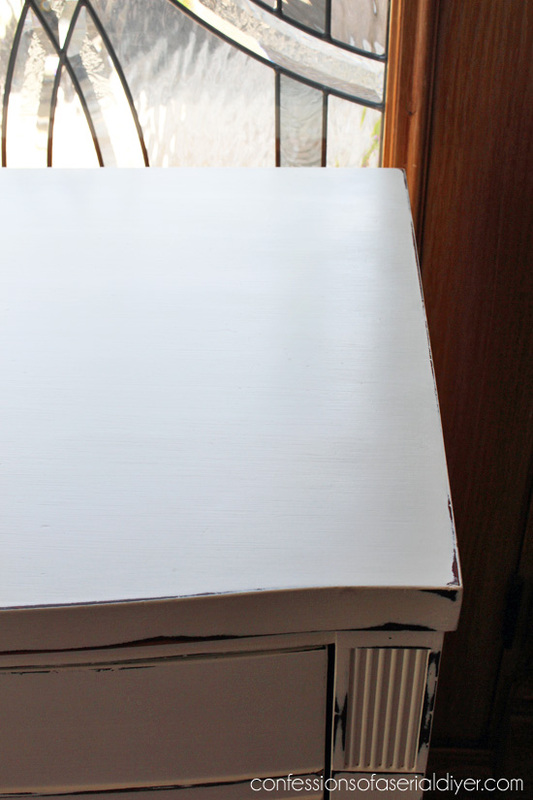 Today I’m sharing how I paint a piece of furniture using chalk paint, from start to finish. Because I use chalk paint on most of my projects, I get a lot of emails about the process of painting with chalk paint. I am always more than happy to answer any questions that come my way, but I thought it was about time I put together one helpful post that I can refer my readers to. So let’s get started! I have included some affiliate links so you can find the products I use. Click here to read my full disclosure policy. She’s a gorgeous $40 yard sale score I shared in my last post, and I thought she would be perfect for this tutorial. Click on the photo or link below the photo to see more. Let’s start by choosing paint. Those of you that follow me regularly have heard me talk about my go-to chalk paint recipe. I make my own and it is less than a third of the cost of the brand name chalk paints. This is what I use the majority of the time. 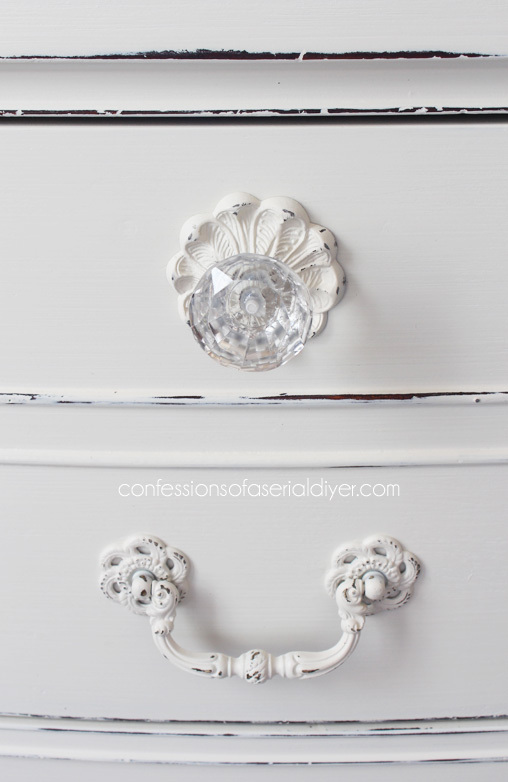 If you would rather use a pre-mixed chalk paint, there are two that I love. The first is Annie Sloan chalk paint. (Find it online HERE.) She has such a lovely color palette and I have used several of her colors and love every single one. You can also see if there is a stockist near you here. I also love Dixie Belle Paint. It can be found on Amazon here. Fluff is a vintage white that I have used a few times and I just love it. The first thing you’ll need to do is give your soon-to-be masterpiece a wipe down. I use cleaning wipes like Lysol or Clorox wipes or even the generic brands which work equally as well. 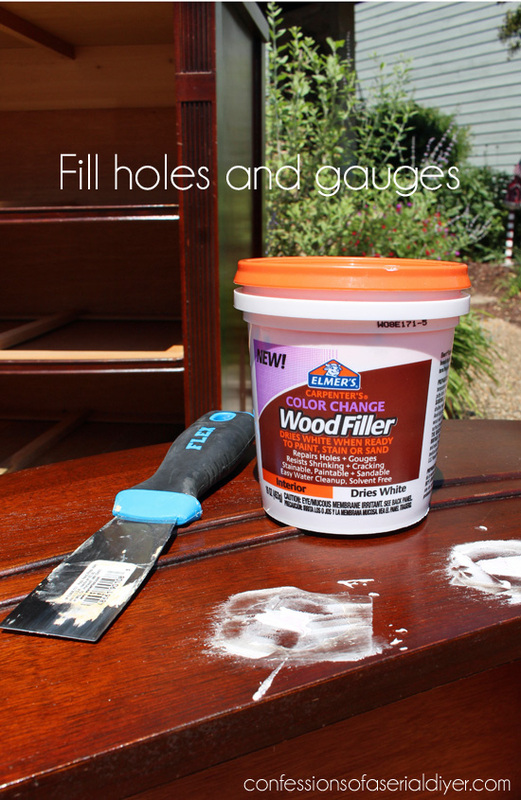 Look your furniture piece over for any gouges or deep scratches that need filling. This dresser had a pretty deep ring on top, several deep gauges, and some missing veneer. I also planned to swap a couple of the original drawer handles out for single glass knobs since one was missing, so the old holes needed to be filled. This goes on pink and dries white to let you know when it’s dry and ready to sand. To see if it is smooth enough, run your fingers across the surface with your eyes closed. You shouldn’t be able to feel where you patched. You may need to add a little more filler a second time, but that should do it. The glass knob in the photo below has a patched hole on either side, but you would never know. 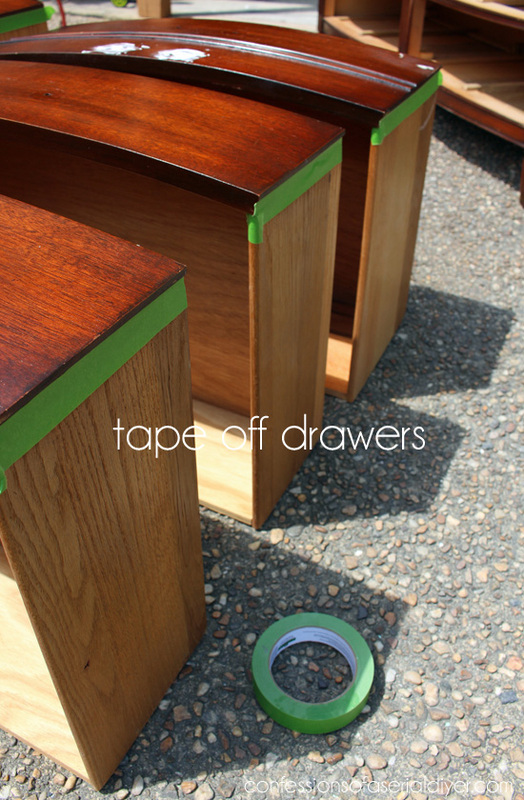 The only thing I really ever tape off is the sides of the drawers. I like FrogTape for this. That will bleed though every layer. Don’t panic! There is an easy fix. Now we’re ready for paint! 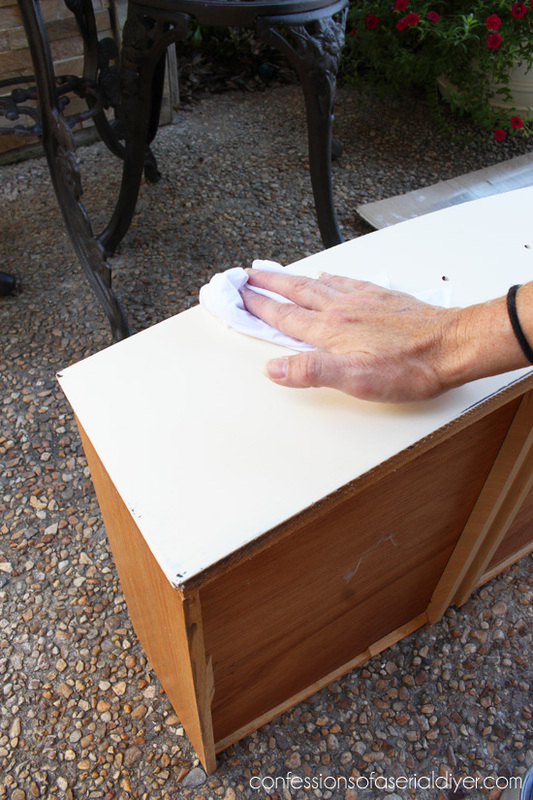 If you are painting a dresser or table, start at the bottom. Since the top will get the most attention, you’ll want that to look perfect, so leave that for last. Paint in long sweeping strokes, going with the grain. On a horizontal surface, try to go from side to side without stopping, always keeping a wet edge. Chalk paint dries fast, really fast. So you have to work quickly. 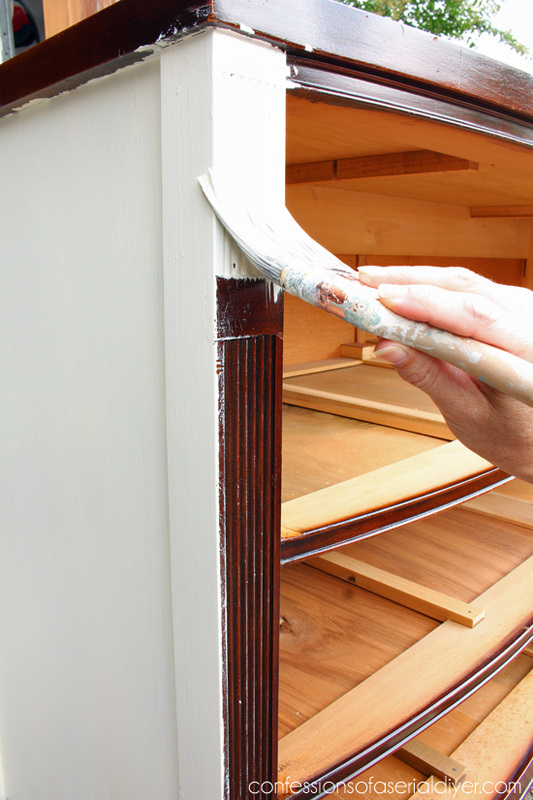 If you are painting something white or off white over a dark piece, you will probably need three coats for solid coverage. But because the paint dries really quickly, you don’t have a long wait in between coats. 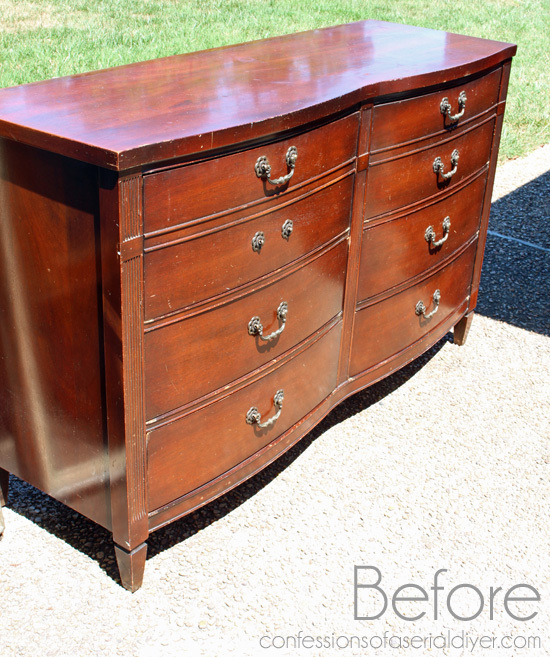 If you want your piece more distressed, you may be happy after only two coats. Darker colors have excellent coverage and rarely need more than two coats. 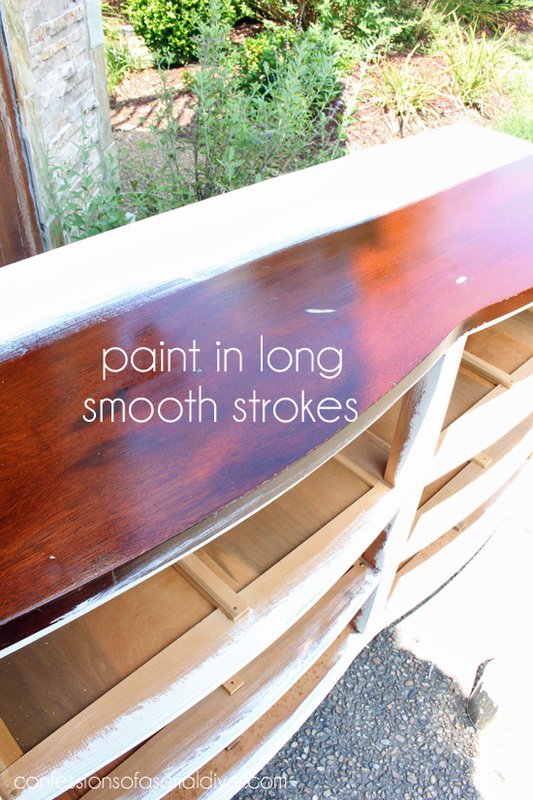 The second and third coats will go on more smoothly if you add a tiny bit of water to your paint. (I usually forget.) So if you find the subsequent coats to be a bit thick, add a little water. Time to remove any tape. This sander does a nice even job on the top and sides. You will have less control though, so if you want very minimal distressing, I recommend sanding by hand. After all surfaces are smooth to the touch, I use a shop vac with a brush attachment to vacuum up all the chalk paint dust from the surfaces. Time to wax. The wax will bond with the paint to create a long lasting durable finish. It will deepen and enhance the color of your paint, but it won’t change the color. Wax takes 21 days to fully cure, so use your furniture piece with care until then. Honestly I am really happy with it so that is what I continue to use. I have heard others have success with Minwax Paste Finishing Wax and a couple of others that are also less expensive. One can goes a very long way though, and I can easily do several projects with it. They are perfect. I prefer to use a clean soft cloth verses a wax brush. Then working in small sections, rub it into the surface. Here on this drawer I started across the top going back and forth pushing the wax into the surface. Just a few strokes back and forth and you will be able to feel how smooth the surface is. If it is still tacky or sticky, continue to wipe until smooth to the touch. 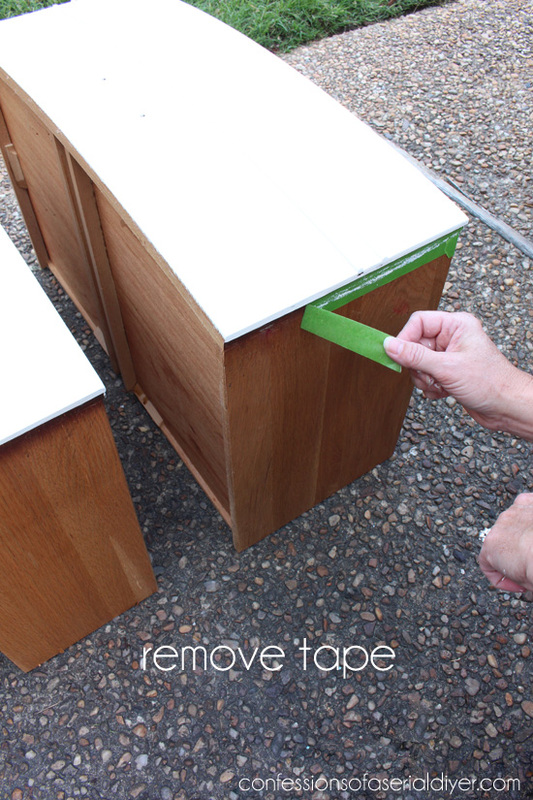 For a drawer like this, I actually would cover the whole surface with wax, then buff it off. For a larger surface, I would work in sections, moving back and forth across the surface. Try not to stop in the center as you will feel the wax build up there a bit. Try to go from edge to edge, working quickly. You will need to switch cloths as wax begins to build up. After you have covered the entire surface, wait about 10-15 minutes and then go back with another clean soft cloth and buff for more sheen. If you see streaky areas, apply a bit more wax and buff. 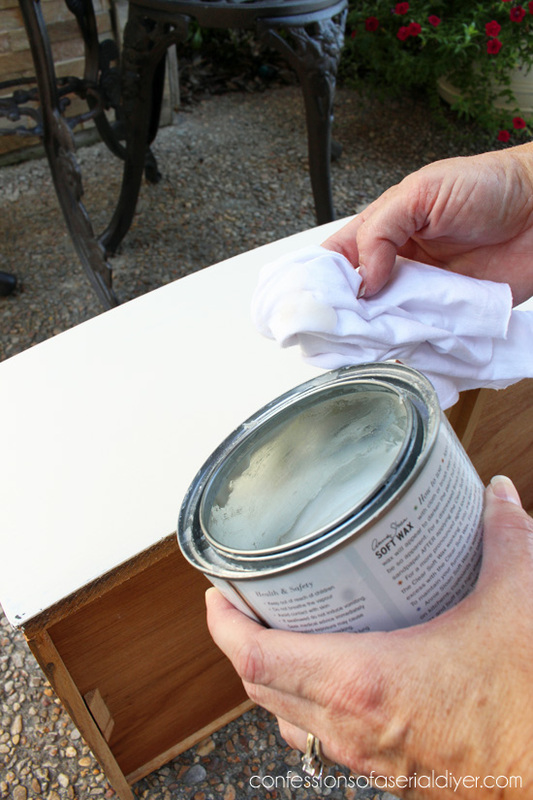 For horizontal surfaces that will get a lot of wear such as a table top or dresser top, I add a second coat an hour or so later. I usually continue to use the cloths until they are no longer functional, then toss them, but they can be washed. I have used a wax brush quite a bit as well. Dip your brush in the wax and apply with the grain, then go behind and wipe clean with a clean soft cloth, working in small sections. The surface should feel smooth after wiping. If it still feels tacky, continue to wipe until it feels smooth. Your brush will easily clean up with a grease fighting dish liquid like Dawn and warm water. I don’t usually use dark wax. I went through a phase where I used antiquing gel on everything back in the day and I think I just overdid it. If you want to add dark wax to highlight details and add a bit more character, apply after the clear wax and in small amounts. If you use too much, add a little clear wax to remove it. Continue to work it into the surface until it feels smooth to the touch. Use a separate cloth or brush for each kind of wax. 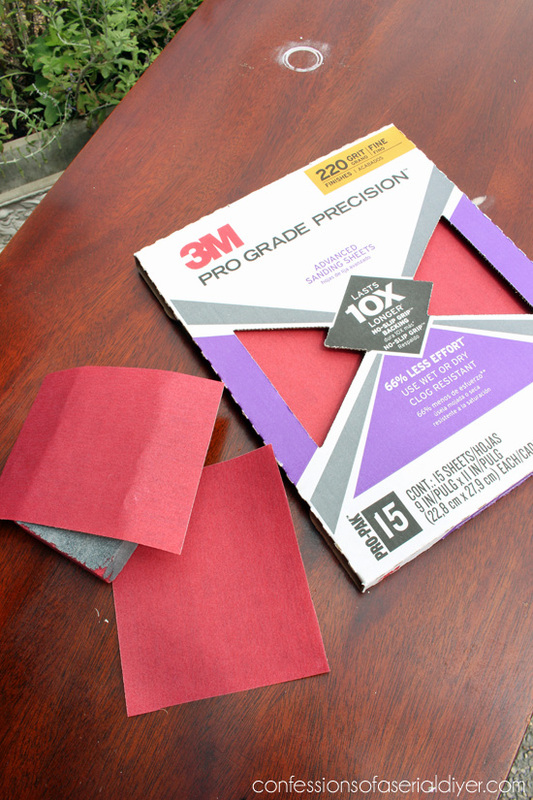 Here I used 12×12 scrapbook paper from Michaels that I already had on hand. 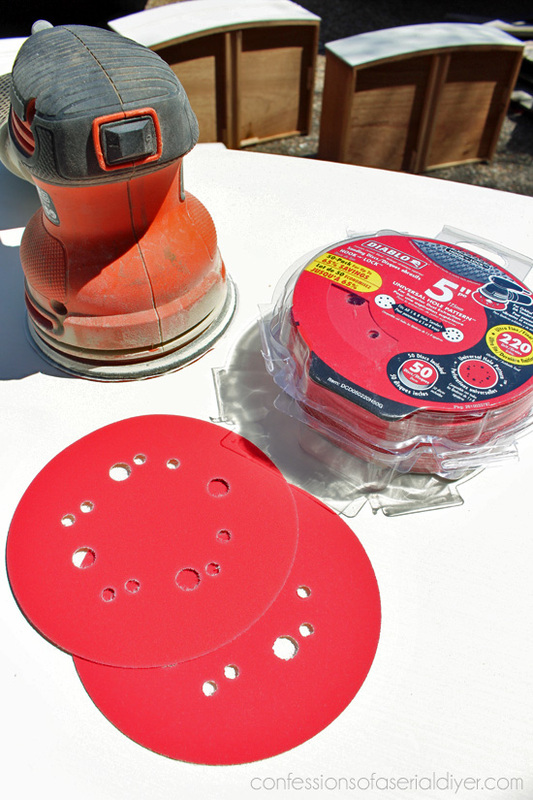 A rotary cutter and straight edge make it super easy to cut the pieces. Try to match up the pattern for a seamless look. A glue stick is a simple and inexpensive way to adhere the paper to the bottom. I also often use Mod Podge in Matte ; you can see that process here. 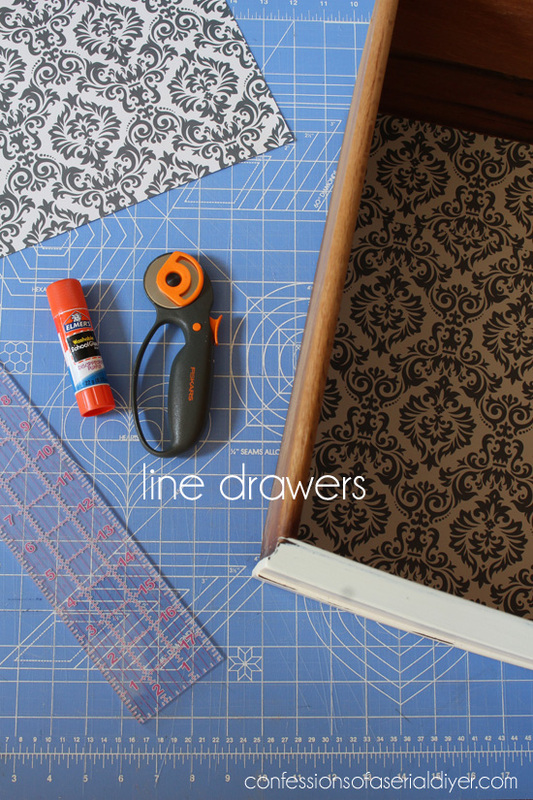 I usually prefer to use fabric as I can easily cover the whole bottom of the drawer without any seams. I apply that with Matte Mod Podge and a chip brush. That’s all there is to it. Not too bad, right? To care for your chalk painted pieces, Pledge and a soft cloth are all you need. If you get any marks in your finish, apply pledge furniture polish to the area and buff with a soft cloth, and they will come right out. Any furniture polish should do, that is just what I use. It has been several years, and it is still going strong! I was a total amateur but I did it, and so can you! Play around with a test piece if you’re feeling nervous, but I know you will do just fine! Feel free to browse my DIY Project Gallery to see all my projects in one place, many of which are chalk-painted projects. 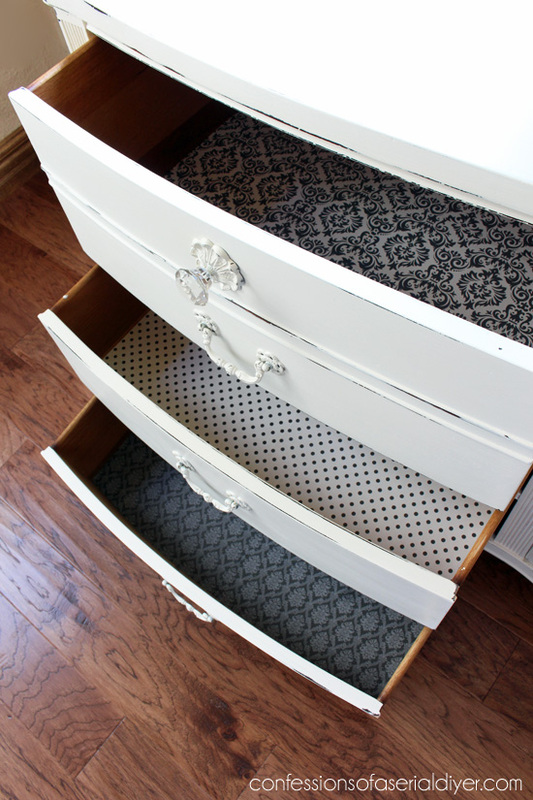 Chalk paint is not just for furniture either, it works wonders on metal, plastic, laminate, glass, and fabric! If anyone has any more tips or tricks, we’d all love to hear them in the comments! Thank you for this! I’ll be bookmarking it and referring to it a lot. This is one of my absolute favorite blogs and you inspire me every day. This post is so timely for me because I just finished chalk painting a headboard bench that I built following your instructions. But I’m not sure how to seal it. It will be out in the elements getting sun in the summer and snow in the winter so I don’t think wax would work. The guy at Home Depot told me to use spar varnish, but the bench is painted white and I’m afraid of it yellowing. What would you suggest? Helmsman Spar Urethane – clear satin. 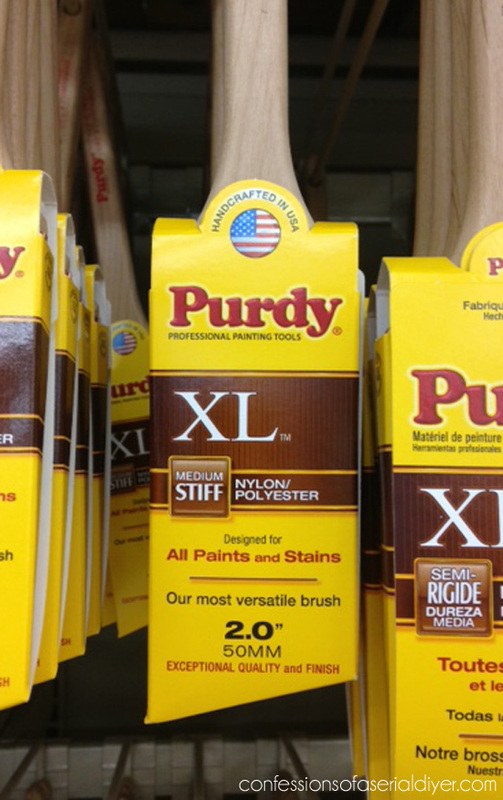 I just used it on a light grey stained screen door and it did not yellow the stain. Went on clear and not too glossy. The product has oils in it that allow the wood to expand/contract with changing temperatures and weather. Hence it’s for outdoor use. 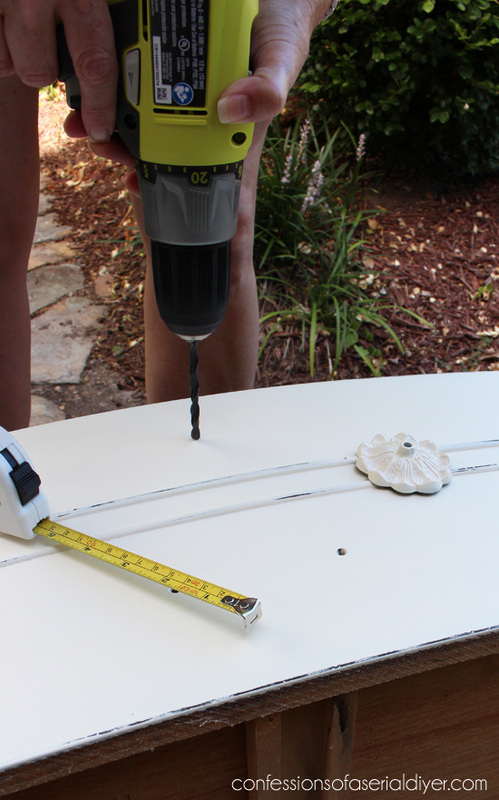 It’s called “marine grade” for boat use, but it’s good for any outdoor wood project. Thanks so much Christy for the tutorial. I have yet to try my hand at chalk painting furniture…have been jotting all info on process and you’ve created a Start to Finish guide. Super!! Your unreal transformation of thrifted finds has prompted me to try this with your recipe. Thank you for sharing this post! I i have read many ‘paint your furniture with chalk paint’ post but this one seems to have captured my attention and have given the the desire to (finally) tackle my own project! As with yourself, I am so disappointed that summer is coming to an end, my daughter goes back to school tomorrow…bye bye beach! Have a great fall! You did a fantabulous job and what a great tutorial. Read every bit of it and learned a lot. Thank you! Wow, Christy, great tips! I can make a mess when painting so I’ve really enjoyed using a canvas drop cloth. After a while, the drop cloth is fun to cut up and make things with. 🙂 I did get a cheapo Elmer’s wood filler rather than the pink to white. Lesson learned. 🙂 Thanks so much! Thank you so much, Christy, for putting together this video! It is an awesome reference tool! Love your straightforward down-to-earth style of writing and instruction! Thank you so much for the tutorial! I love your painted pieces but have yet to try painting one of my own – perhaps now, with such wonderful instructions, I will finally try! Thank you so much for the step by step with complete pictures. I gives me the confidence to try a project. My question is about the wax. 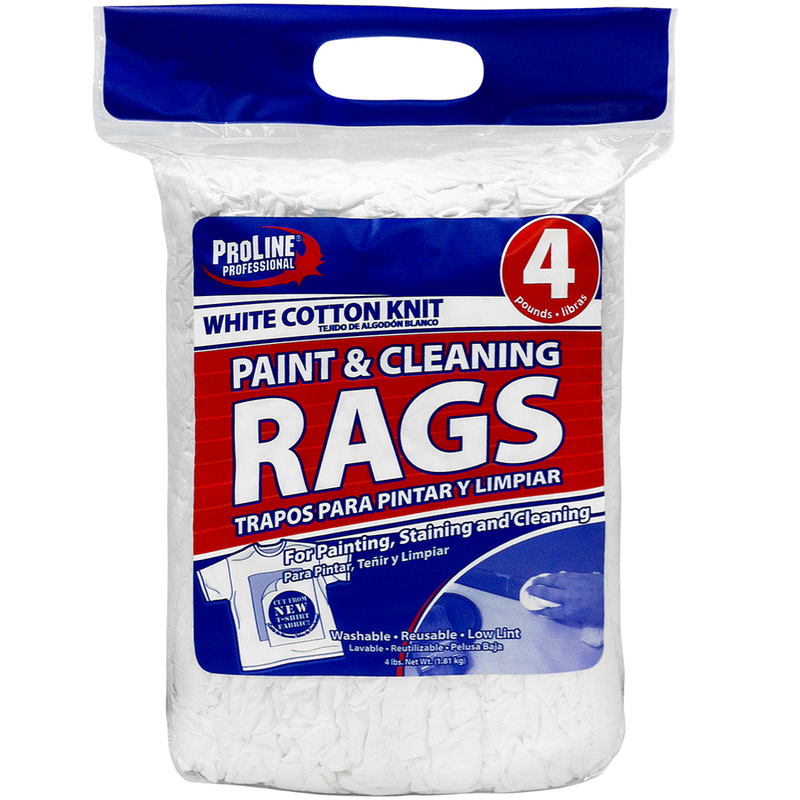 Would you use this on every paint project even if it isn’t chalk? Does it seal and protect thru all paints? I have a office chair I am going to paint the seat with chalk paint and all the plastic parts were painted with Rustoleum. Not sure if I should wax the legs, arms etc. that are all plastic. You are so welcome! Great question! 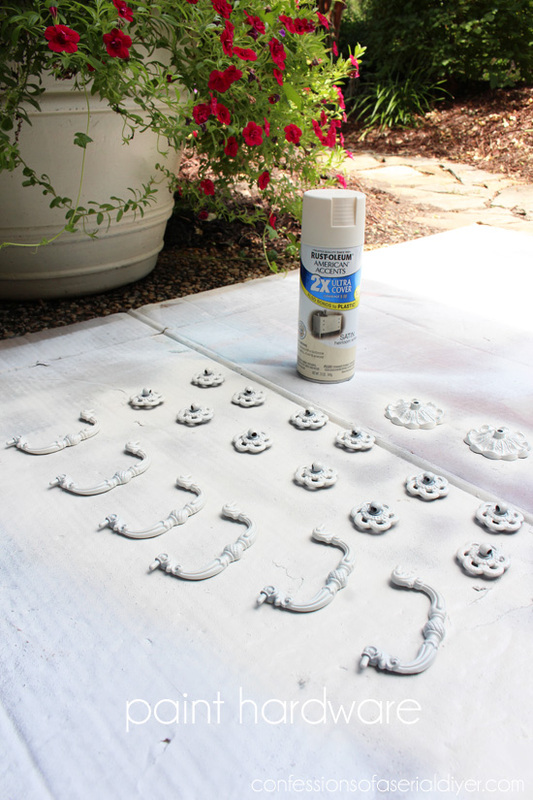 The parts that were painted with Rustoleum shouldn’t need to be sealed at all, especially if you spray primed first. I have used wax on other painted surfaces though, so you could if you wanted to. Thank you for the tutorial on chalk painting. 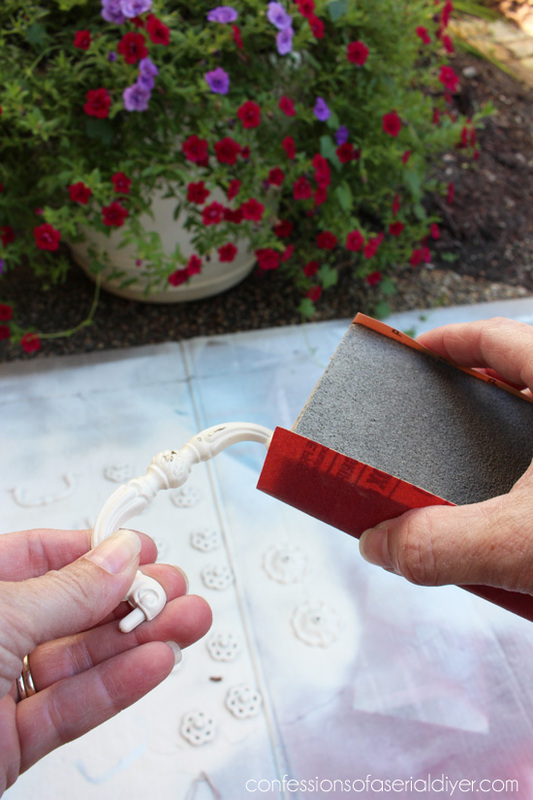 As you can imagine, there are lots of other tutorials regarding how to chalk paint. You have listed all the steps which is a nice change of pace. I do have a question regarding using chalk paint for a table or dresser top. I have read other blogs which they had advised not to wax the table top and using a topcoat instead. Have you had any problems with using wax instead? Also, had to you clean a table top after the wax has been applied? I’m thinking of tackling my dining room set. These are the best instructions ever. Even though I do use the chalk paint I love to read your instructions and learn a few tricks or remind me of what I may have overlooked. So sorry for the not reading before sending. What I meant to say is how do you clean a table top after it’s been waxed? Do you use something special? This is a wonderful step-by-step tutorial, Christy. I’m the one that has the mahogany set that is so similar to your project dresser. 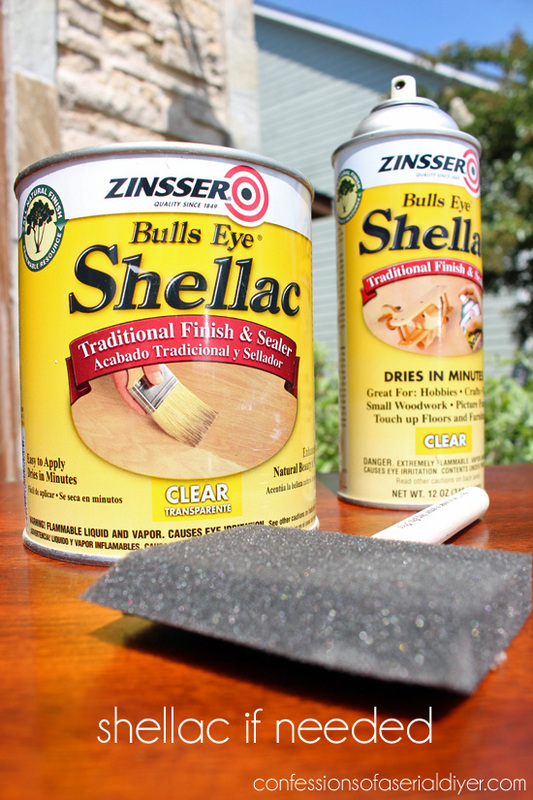 I’m so glad you mentioned the Shellac–I don’t think I would have remembered that step before I started painting. If I choose to re-stain the tops, do you just sand them, or do you use some kind of stripper? I’m not sure the best way to get the stain off all of the curves. Thanks for sharing all your wonderful projects–they are inspiring! Excellent chalk painting tutorial, Christy! You asked, so here’s my two cents. 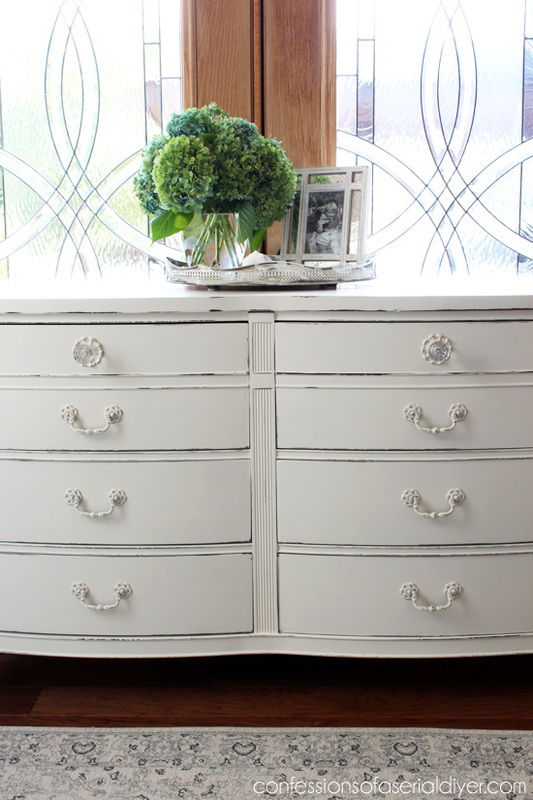 I’ve had great success with Country Chic Chalk Paint – I find it comparible to ASCP (which I also use). To remove dark wax when clear wax isn’t removing enough of it, dab Mineral Spirits onto a clean cloth and the wax will disappear effortlessly. I also use it to clean my wax brushes. 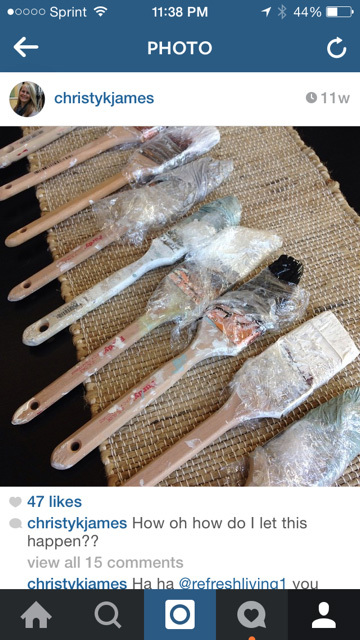 I still haven’t tried your homemade recipe for chalk paint – I’m so lazy. Looks great!!! I have stripped furniture for years but….only have re-stained. Now I have an antique dresser with some lovely do-dads (draping roses) on the top drawer. I am torn on how I should refinish it. Latex or chalk paint??? I want it a green and the details in dark wax. I also want to leave the top stained in walnut. HELP!!!!! Do you use latex? HELP!!!! Fantastic instructions! This piece turned out professional! So Pretty! You do beautiful work! Please come and share! I would love it if you would join in on my Making Broken Beautiful party! It starts 6:00pm (MST) this Thursday September 10 and I would love to have you join up each week! Great article, I can’t wait to get started!! I just had one question – about how long do you wait to see if it’s going to be a bleeder? How soon after painting your test area does it start to bleed through? Thanks, Julie! 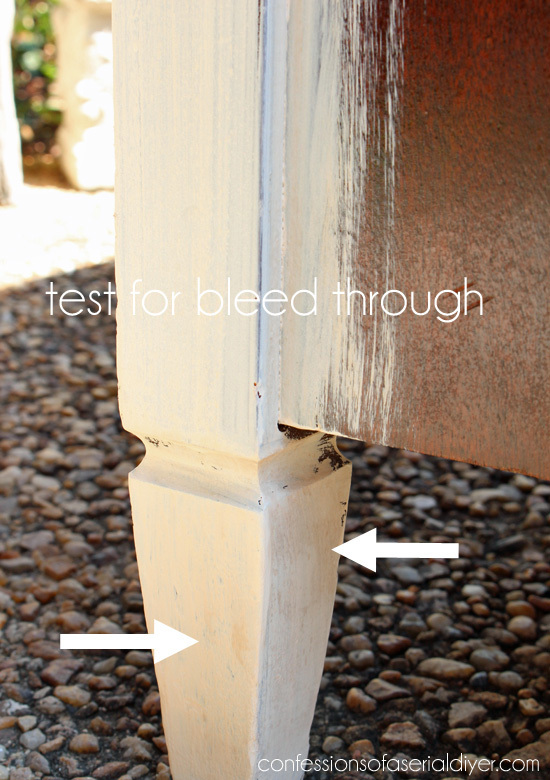 Chalk paint dries super fast and almost as soon as it’s dry you will notice bleed through. Even if you don’t notice it until it’s half way painted, you can still shellac over what you’ve painted and then repaint. Using instructions from your website I did a small entry table and mirror earlier this year to practice for my big project….a Duncan Phyfe set with china hutch, buffet, table and 6 chairs. Unfortunately the set is mahogany so some extra work to do but I also practiced on a mahogany silverware chest and the shellac worked great. I’m going to restain the tops of the pieces, like your table. I’ve been putting it off a bit and feeling nervous but reading this tutorial has renewed my excitement to get going on this project. Thanks so much for all your tips and tricks and making it seem so doable. Wish me luck! I just discovered your blog and love everything you do!! I have been looking for a great tutorial for chalk paint and you delivered! Can’t wait to do a buffet I have. With that set, I sprayed primed and spray-painted the chairs. It was very fast and did work great, but didn’t have the soft smooth rich feel that a chalk painted piece would have after being waxed. I don’t know that I helped much, but hopefully I answered your questions. Good luck! Thanks for the quick reply, Christy! Your post on the remake of the dining room table and chairs is what inspired me – it looks fresh, and clean and, chic, and exactly the style I want for myself. 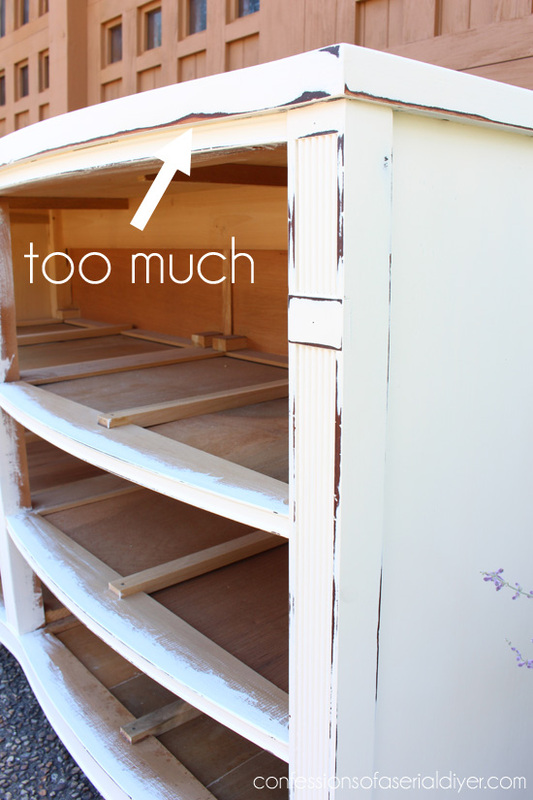 I am planning on staining the top in the ligther shade to match a bakers rack I recently purchased. I would still have to sand the pieces to get a nice even surface but I appreciate your reply and the detailed posts on the techniques that you’ve used. Thank you very much! I love your blog! You are so welcome! Best of luck! ? 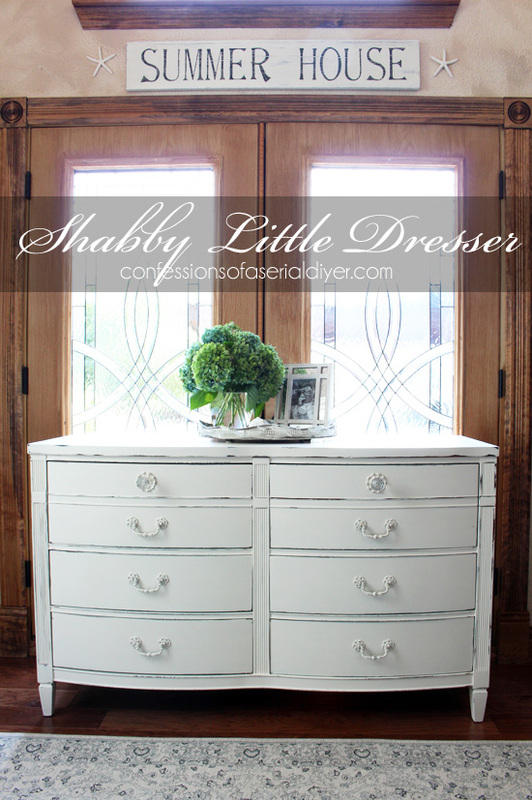 I love reading your instructional blog…..I have a few pieces that I have been wanting to chalk paint but hesitate because I have never used chalk paint (I have used latex in the past)…..I have a beautiful french dresser. You have encouraged me and I will start! 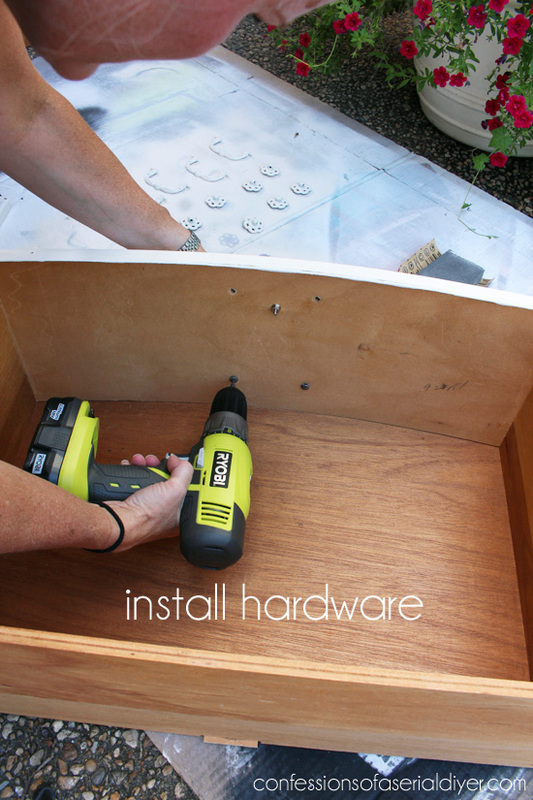 All the pictures you added to show the step by step process makes it so much easier to follow along with the instruction. Your instruction is great as well. I really had no idea that dark wax wasn’t the best thing to use, I’ll be sure and use clear wax instead. 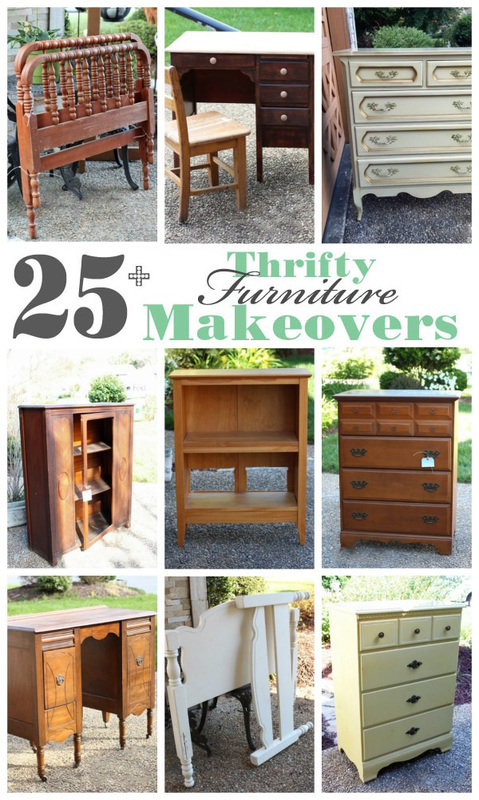 I love the idea of using chalk paint on furniture I’m excited to try this out sometime! Thank You. I am about to paint my first fabric chair. 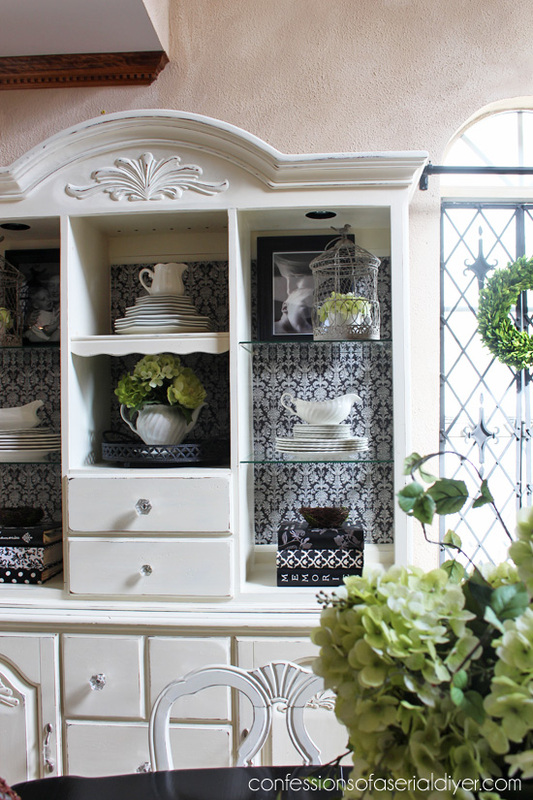 I just finished painting my kitchen cabinets with Annie Sloan chalk paint. My next piece is to paint a fabric living room chair with chalk paint. Have you used your recipe on fabric? From what I have read, AS paint does not leave the fabric stiff. Painting on fabric looks like it will use a lot of paint so it would be nice to save some money making my own. Thanks for your great tutorial. Thanks Christy. Watched several Annie videos about painting fabric and was aware about spraying the fabric as well as cutting the paint with water to thin it. Perhaps I will experiment on a small chair first before I tackle the larger one. Today’s the day! I’ll be starting my first project with your chalk paint recipe and I can’t wait to get started! Fingers crossed that all goes well. Thank you so much for the inspiration and tutorial. Hi Christy. I am thinking of trying your chalk paint recipe with some Latex paint I already have at home. Just wondering if it will work with any kind of latex paint , i.e. Eggshell, semigloss, etc. I loved your tutorial and would love to give it a try! I just started my first project with chalk paint. I started with a roller, but switched almost immediately to a brush. Do you find that a roller uses too much paint? Is there a way that you have found to use a roller (at least for the first coat) that does not do this? Hi Julie! I don’t use a roller, just a brush. I agree that the roller soaks up way too much paint and I just find it easier for me to use a brush from start to finish. Oh no! I haven’t had the wax yellow before…I wonder if it could be bleed-through from the stain beneath? If that’s the case, you can paint right over the wax and then wax again. The original wax will have sealed in the stain. Or you can paint over the original wax and seal with Polycrylic (blue can) in satin instead if you fear it really is the wax. Hope this helps! Hi Christy! I’ve done chalk painting on several pieces before, but this is the first time that I painted a color I didn’t like. :o/ Instead of an antique white, Lowes mixed it almost pure white. I thought maybe after the second coat I would see some of the off-white come out, but no-go. Can I paint over it with a new chalk paint color, or is the furniture doomed? GO for it! 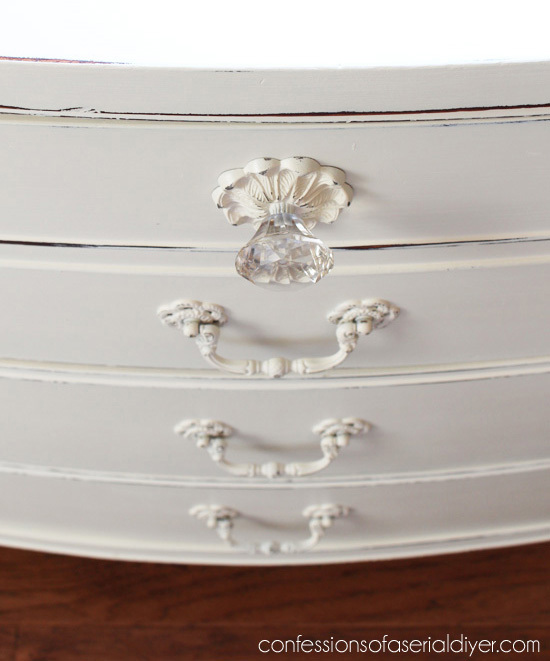 You can paint right over chalk paint or wax! I have read many blogs and used several different recipes and yours has been the best, hands down! I just finished a cherry bedroom set; two side tables and a dresser. I used your cottage white from Home Depot-you should receive a coupon at least. It looks so fabulous! Thanks for such an informative blog. I, too, love AS chalk paint! 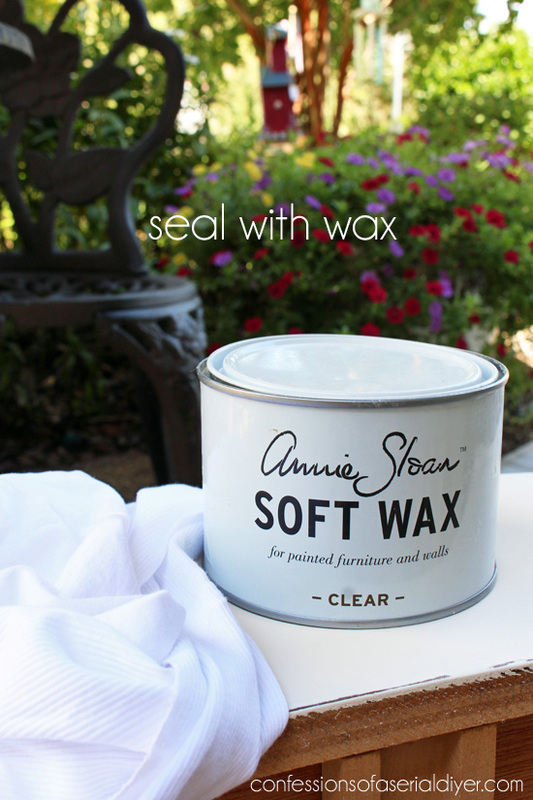 I use both the soft AS Clear Wax and the AS Dark Wax. One of the tricks I have learned using the soft clear/dark wax is to apply it with a soft cotton rag, let it set for about 15-20 minutes, and then come back and buff it out with a 000 or 0000 fine steel wool. It leaves the surface soft as a baby’s bottom. I am so excited i came across your tutorial! I am finally going to try my first dresser, now that I am on a time constraint and am expecting my first little girl 🙂 it will be for her room. I found this gem for free with a matching mirror. fingers crossed it comes out! I agree, this was an excellent step-by-step tutorial. I looked all over trying to find good instructions, and I thank you for taking the time to do it. I painted a chest black for my son and read on another site that you need to rewax every month or so. Is this the what you find? As one reader mentioned, the chest is very rough and unattractive now, but I’m in hopes that when I wax it, the sheen will be there. I was trying to decide if I should repaint with a glossier paint and be done with it, but I think you’ve convinced me that it will look nice in the end. I really didn’t want to worry about upkeep on this chest. I’m glad you found my tutorial helpful, Janie! I will tell you that I don’t usually go back and wax. I clean regularly with Pledge and that helps to keep my surfaces looking their best. Black is tricky though…sometimes no matter how much you buff, the wax still appears streaky in places. You can test it on a scrap piece first in small corner and see how you like it, but if I planned to use black, I would probably do it the old-fashioned way: sand, prime, paint with latex satin. Satin will still have a beautiful sheen without being too glossy. Best of luck to you!! I ve tried and because of you it’s perfect. Great tutorial! I do have one question . Since using the shellac did you have any crackling of the chalk paint ? I recently used shellac on a mahogany side table and resulted In lots of cracks. Trying to figure out if it’s the shellac or something else.. Thank you! Thanks, Alli! I have not had that issue using shellac. Not sure what would cause that? me encanta todo lo que haces en restauración….y un excelente DIY… te felicito me encanta tu manera de explicar . tengo una pregunta:en que casos consideras es necesario retirar la pintura vieja ? , tengo una cama vieja pero no se si debo empezar por retirarla pintura anterior . love everything you do on restoration …. and excellent DIY … I congratulate you I love your way to explain. I have a question: in that case consider is necessary to remove the old paint? , I have an old bed but not if I start by remove old paint. Thanks, Karine! If the old paint is in good shape, you can paint over it. 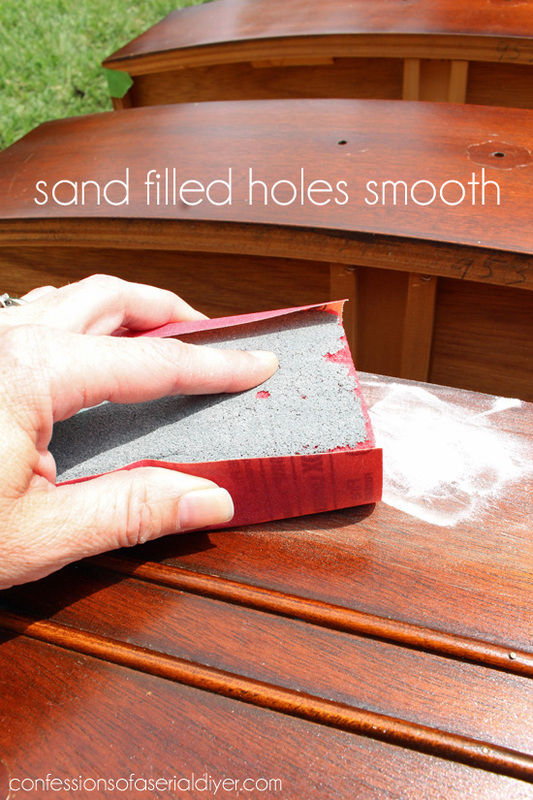 Keep in mind that if you decide to sand a little to distress the edges, you will see the paint color underneath.